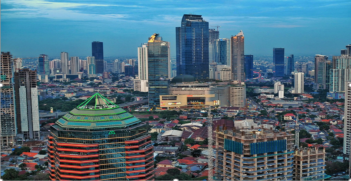 On 25 May 2018, Indonesia passed a revised Anti-Terrorism Law following a series of suicide bombings and armed attacks on churches and police posts in East Java and Sumatra. The Surabaya attacks, which included suicide bombings of mothers and their young children, were preceded by a 36-hour urban hostage situation at Indonesian National Police (POLRI) Mobile Brigade Headquarters in South Jakarta, resulting in the execution of five officers by Jemaah Ansharut Daulah (JAD) extremists. These were unprecedented developments for Indonesia that presented a disturbing shift in the modus operandi of violent extremists in Indonesia and an escalation of the threat linked to Islamic State in Iraq and Syria. On 13 May, Indonesia woke to the news of three successive suicide bombings of churches in Surabaya perpetrated by one family. The initial church attacks involved the deaths of Dita Priyanto, his wife Puji Kuswati and their four children, ranging from age nine to 17 years. This attack was followed on the same day by an accidental explosion in an apartment complex in Sidoardjo in East Java, which killed three adults linked to JAD. Three children survived. The following day, a family on two motorcycles detonated themselves at a Surabaya Police Post. The only family member to survive the bombing, an eight year old girl, was rescued from the blast by a police officer. Initial reports that the families were returnees from Syria proved erroneous as the links between the riot at POLRI Headquarters and the families, who were also members of JAD, became clear. The attacks have awoken the nation to the fact that women are not just participants in countering and preventing violent extremism, but increasingly active perpetrators. The President and his senior security officials travelled to Surabaya to inspect the scene of the attacks and address the press. It became clear in both their statements that the sense of shock at suicide attacks involving young children rendered further delay in revisions to the Anti-Terrorism Bill untenable. Following the initial church attacks, President Jokowi gave the legislature (Dewan Perwakilan Rakyat, DPR) an ultimatum to finalise the Bill by the end of its June sitting term or he would use his executive powers to issue a Governmental Regulation in Lieu of Law. This step came upon the advice of Jokowi’s trusted POLRI Chief, General Tito Karnavian. It meant, in effect, that the DPR would be bypassed on an issue of critical national importance. Indonesia’s legislature was equally shocked by the attacks. No party or faction wanted to be seen as obstructing the negotiation process. Nor did they wish to be perceived as supporting such barbaric acts. It was at this juncture that both the legislature and the cabinet agreed to set aside their differences and work quickly toward a compromise. 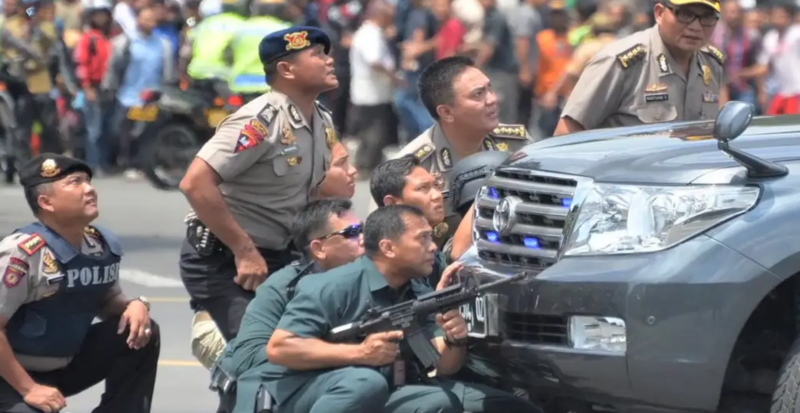 The occurrence of a third attack on a Police station in Pekanbaru on 16 May, which resulted in the death of a police officer and injury of two more, spurred further momentum toward agreement on the Bill. General Karnavian, TNI Commander Air Chief Marshal Hadi Tjahjanto and Coordinating Minister for Political, Legal and Security Affairs General Wiranto (Rtd.) worked closely with Chair of the DPR’s Special Committee, Muhammad Syafii, to ensure timely agreement. The fact that the final Law was ‘less’ than what many key stakeholders had wanted can be regarded in some part as a measure of its success. The negotiations between security chiefs and the DPR, which preceded agreement on the Law, revealed the subordination of partisan aims and institutional interests in pursuit of a higher national policy objective. In comparison to the 2003 Anti-Terrorism Law, the revised Bill underwent a more extensive consultation and deliberation process, not just amongst the various political factions represented in the DPR, but amongst women’s organisations, academics, religious groups and civil society organisations. Some civil society organisations, for example, provided training for the DPR’s Working Committee, and parliamentary deliberations were supported by a number of policy papers from universities and think-tanks. As part of the deliberation process, the DPR compiled a detailed inventory of issues requiring parliamentary factions to submit proposed revisions and argumentation on articles of the Bill. Many non-government stakeholders were keen to ensure both the Bill met contemporary human rights standards and did not privilege repressive measures above the reintegration and rehabilitation of extremists. The passage of the revised law (Undang-Undang Anti-Terorisme No.5/2018) illustrates three important things about process and influence in Indonesia’s contemporary security policy-making. 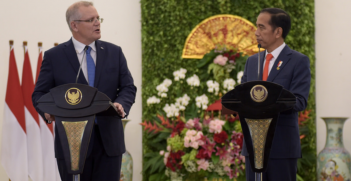 First, in the aftermath of Indonesia’s deadliest attacks since the Bali Bombings, President Jokowi revealed his willingness to assert his executive authority over the legislature on an issue of vital national security concern. The president’s threatened assertion of executive powers proved a critical factor in achieving consensus on Indonesia’s revised Anti-Terrorism Law. The expedited passage of the Bill, which was spurred by the crisis and involved the conscious subordination of partisan interests, illustrates a level of maturity in Indonesia’s democratic polity lacking earlier in the bruising Jakarta gubernatorial contest. Second, the disturbing nature of the suicide bombings, which involved the weaponisation of young children, facilitated a consensus not evident previously between the legislature, executive and security forces on a deeply divisive public policy issue. As conservative parliamentarians and Islamic political parties had a key stake in achieving consensus on the Bill, it will be interesting to see whether this acts as a constraint on future rhetoric or conduct which buoys radical sentiment. Third, the Law’s explicit recognition that the Indonesian Armed Forces (TNI) has a legitimate counter-terrorism role further codifies the military’s role in domestic security with broader implications for the Indonesian polity. For activists and concerned citizens, the Law’s affirmation of the military’s role in counter-terrorism signals a potential further retreat from the key tenets of earlier security legislation, which mandated clearer delineation between POLRI’s internal security responsibilities and TNI’s external defence role. Deep concern on the part of civil society will remain over the return of military as a law enforcement instrument. The nature of the supplementary presidential decree clarifying TNI’s role in counter-terrorism may well be a yardstick for the shape of Indonesia’s future democratic polity. 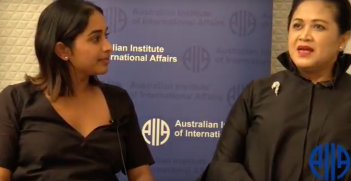 Dr Greta Nabbs-Keller is a Research Fellow at The University of Queensland’s Centre for Policy Futures and Adjunct Lecturer at the School of Political Science and International Studies (POLSIS-UQ). She wishes to acknowledge contributions from government and civil society organisation representatives. This article is an excerpt of more substantive analysis (forthcoming) examining the governmental politics behind Indonesia’s revised Anti-Terrorism Law and what it reveals about influence in Indonesia’s contemporary security policy-making.